See Understanding segmentation for more about segments, and Using Data types, input fields and operators for more about the fields and operators that are available in the UI. The following describes how to create an entirely new segment. You can, however, also create a segment by combining existing segments. See Creating a new combined segment for more details. The New segment page displays, and the system automatically generates a segment name, consisting of the words New segment and the current date. and follow the instructions to add a rule for that category. See the Contactplan Product Overview for a detailed description of rules and query types. You are returned to the New segment page. The rule is added to the Rule list area of the Summary panel, which is displayed to the right of the New segment page. Repeat Step 4 and the rule creation instructions as often as required, to continue to add rules in any of the available categories. When you are creating more than one rule, you need to ensure that you define them in the correct order, so that you can apply the appropriate interaction condition between a pair of rules. See Step 6, Segment Summary panel and Combining segmentation rules for more about interaction conditions. The current release does not allow the order of rules in the Rule list to be changed, once they have been defined. If you are creating, for example, a segment with a number of rules, it is advisable to save the segment when you have added one or two rules, then edit it to add further rules. See Editing a segment for more details. When you have defined two or more rules, you need to determine how one rule in the Rule list interacts with the next rule. In the Summary panel, positioned to the right of the New segment page, locate two consecutive rules in the list and select the appropriate interaction condition, from those listed in the area between the two rules. See Segment Summary panel and Combining segmentation rules for more about interaction conditions. You can also correlate two event-type rules, such as a digital messages rule and a purchases rule. See Creating a segment by correlating rules for more details. When the segment and the associated rules are defined as intended, click Save to store it, or Back to segments list to abort the process. You are returned to the My segments page and the new segment is added to the list. Every time a segment rule is created or edited, a notice informs you what has been changed. 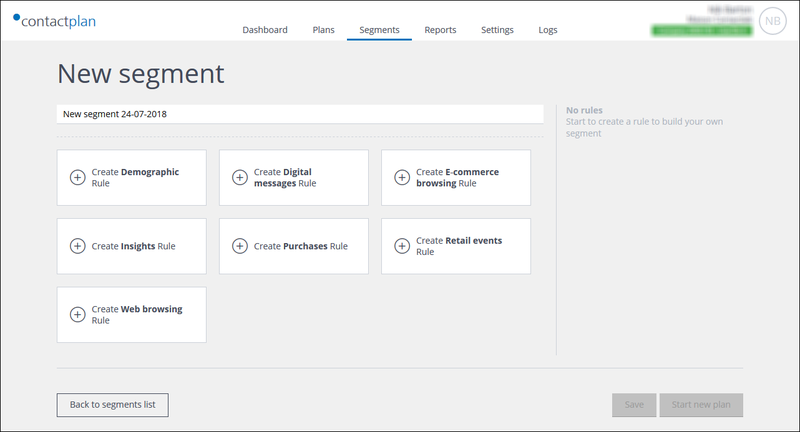 See Example of creating a new segment for more about the segment creation process. A new segment can also be created by cloning an existing segment, then editing it as required. See Cloning a segment for more details.